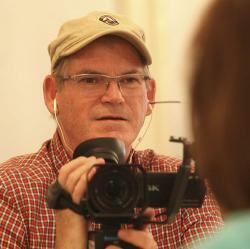 Duane Busick is a video storyteller. A three-time recipient of Individual Artist Grants from the Indiana Arts Commission, Duane’s projects often use oral history interviews to tell the institutional history of community events and to pay homage to the persons who helped build and sustain the events. In 2014, Duane began a continuing video storytelling project profiling the buskers at the Bloomington Community Farmers’ Market. In 2016, he became an official “Ambassador” for BUSK, an advocacy movement for buskers that encourages governments worldwide to embrace this form of free public art in our public spaces. Contributor photo by Garet Cobb. Bev Knight’s collection of more than 400 varieties of azaleas started with a UPS delivery to a doctor. Now her family’s Azalea Path Botanical Garden and Arboretum is known nationwide for its woodland flowers (among other plants). Videographer Duane Busick calls the southern Indiana destination "a hidden patch of paradise." Watch his video here. “Clap your hands, clap your hands!” And a lone figure stands, claps, and dances. Others rise to join him while Richie Havens sings “Freedom! Freedom!” onstage at Woodstock in 1969. In this Duane Busick video, meet Jesse Slokum, Bloomington’s “Busker 4 Freedom” and the man who got multitudes to dance at Woodstock. Click here to watch the video.